The John 10: 1-10 Gospel reading for the 4th Sunday after Easter transports us directly into the world of animal husbandry – a world which hasn’t changed much for the past 2000 years. However, the image of sheep is at the center of Jesus’ discourse which centers on one’s spiritual life. In verse 6, John, as if to underscore the fact that Jesus’ sheep image is not to be taken literally, informs us: “Jesus used this figure of speech with them, but they did not understand what he was saying to them”. So here we have what is perhaps one of the most essential teachings of Jesus being misunderstood by his disciples and labeled explicitly by John as a communication failure -a breakdown of language and teaching. Two questions immediately jump to mind: First, how can this happen given Jesus’ teaching authority? Second, why does John go out of his way to point out this failure? First, let us return to the sheep. The French expression, Revenons à nos moutons is famous and simply means, Let’s return to our sheep. This expression is used in French whenever someone goes off topic, or gets lost in something that is not central to the original discussion. It is a verbal reminder to bring the subject of the conversation back into focus. 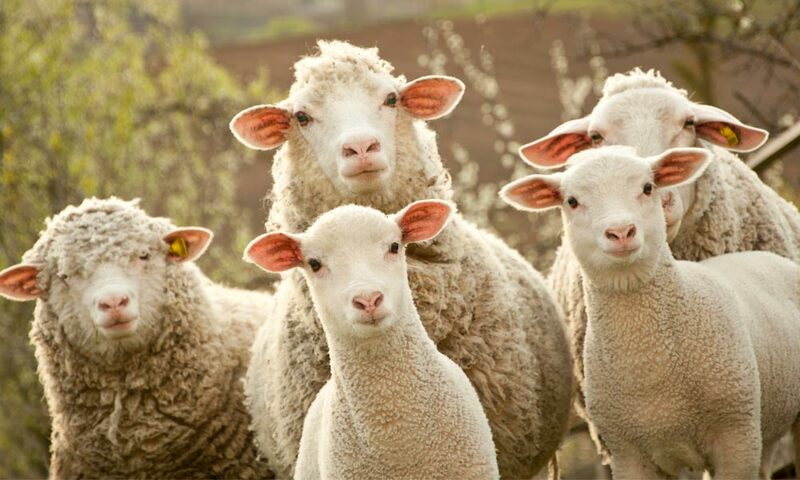 This expression was used in a 15th century Parisian comedy in which the lawyer representing a crooked shepherd who had stolen sheep from another shepherd, attempted to divert the courtroom away from his crime, forcing the judge to continually repeat the phrase, Let’s Return to our Sheep! When we focus on the idea of physical sheep, we tend to think of rather dumb animals which are raised by their owners for wool, milk, hides, and especially their meat for human consumption. In most parts of the world, lambs are protected from predators like wolves only to be later slaughtered for human consumption and enjoyment. For some, this sheep image/metaphor, when used as a comparison with people, is uncomfortable since sheep seemingly lack those highly valued qualities in us such as intelligence, self-determination, independence, and the ability to defend and protect ourselves from danger. It was perhaps this jarring mismatch of the nature of humans vs animals that caused John to note the lack of understanding in Jesus’ discourse. However, sheep also lack something else. Like all animals, they are innocent and have no guilt to deal with. We recall John the Baptist’s words earlier in the same Gospel verse 29: Behold the Lamb of God who takes away the sin of the world”. How is it that a lamb, totally lacking in those qualities which we humans value the most, can assume the highest and most absolute value imaginable – that of salvation? One answer might be found in Psalm 23, The Lord is my Shepherd. This Psalm was read on the same Sunday as John 10:1-10 and brings sheep into the picture again. Perhaps the New Testament evangelist is returning to the Old Testament sheep in the 23rd Psalm. In contrast to Jesus’ words in John 10 (spoken in the 3rd person, as a teaching story, descriptively) which involve movement of the sheep - going both out of and back into the sheepfold via the gate/portal (Christ himself), the 23rd Psalm paints a radically different setting and picture. In the psalm, it is none other than the sheep themselves who speak in the 1st person (I statements) to God the good shepherd in the 2nd person (you statements). “Surely your goodness and mercy will follow me all the days of my life and I shall dwell in the house of the Lord forever”. The sheep of Psalm 23 are in an intimate relationship with their shepherd in whom they place all their faith and trust. The sheepfold and gate mentioned in John 10 are nowhere to be found in the Psalm. Here there is no need for a metaphor or figure of speech. The sheep are out/outside the sheepfold now - verbal, conscious, and facing death and evil with courage due to their relationship with the shepherd. There is little to misunderstand or misinterpret in this memorable psalm. I am a newcomer to this community and this town -- in fact, it is my first visit not only to St. Paul’s but also to Palm Springs. Given that, you’d think I should be cautious about offering you directives, but I’m going to dive right in: today, you’ll really need to let go of linear thinking or a need for singular, black and white answers. You need to get comfortable with paradox. Before you get worked up, let me just say that I’m only following Jesus’ lead, as described in the Gospel of John. He is using figures of speech, as he does throughout the whole book, to try to communicate about who he is, the nature of God, and who we are. But the figures of speech are, shall we say, less than perfectly consistent. He’s talking about a shepherd. But then, surprise! He says he’s the gate, not the shepherd. But then -- wait for it -- in the very next verse, not read today, he says, actually, I am the good shepherd. We can get really worked up about all of this, and look for creative stories about shepherds in the Middle East who lay down across the gap in their sheep enclosure at night, thus being BOTH gate and shepherd (and these stories exist), or we can follow Jesus’ lead and simply explore the varied imagery; work with it. What’s beneath the images of both gate and shepherd? The primary elements of these roles as we encounter them today seem to be protection and provision: protection from evil, from those who seek to kill or steal or destroy, and provision of life, nourishment, abundance through travel to the right places. “Whoever enters by me will be saved, and will come in and go out and find pasture.” When we hear the word pasture, it means not simply a beautiful place; it means food for life. While there are many concepts here that invite further reflection, today I’d like to focus on the paradoxical movement that runs beneath the pastoral themes of our gospel, the 23rd psalm, and even to some extent the description of the early church we heard in Acts: it seems that no matter how you parse the small details, the bigger picture of our life under the shepherding of Christ is one of coming in and going out; journey and rest; peril and protection; giving and receiving; “heading out” and then safe haven; movement to and from the enclosure. Of course, we know this on some level -- our tradition teaches both of these aspects as essential to the life of faith. We have lots of words for these two parts of dynamic movement in and out: action and contemplation; mission and fellowship; the church that takes risks and the church that offers retreat. Wait a minute, you say. He drives them out? I thought he just “leads them.” Maybe you’ll notice that this is not the translation we heard. But it is a valid translation of verse 3: same greek word that in other cases is translated more strongly. To further venture into this theme of movement, I’d like to invite you into a fresh hearing of that old favorite, psalm 23, with the help on the Hebrew translation from Joel LeMon, an Old Testament professor at Emory University -- because I studied Greek in seminary, and not Hebrew. But here is the image of the 23rd psalm I developed over time: a somewhat sentimental one, with a beautiful but hazy image of lounging in a green pasture, a lovely place beside a lake with God where there is comfort and peace, an ultimate reality that is true even when we face death. Much of that is based on the text. But there’s also a lot missing: namely, that this psalm describes an ongoing journey that God oversees and guides, a journey in which rest and nourishment are simply one relatively small part of the picture. Here’s a recap, with a couple translation changes and annotations that emphasize accuracy and consistency with other Hebrew texts over tradition: The Lord is my shepherd, I shall not want. He leads me beside still waters; he leads me into well-worn grooves of goodness that glorify God; when I walk through the darkest valley, I fear no evil; your rod and your staff -- they comfort me, because they represent protection from real and present dangers; goodness and mercy shall chase me and pursue me all the days of my life, and I shall continually return to God’s presence, my whole life long. How is Christ, the good shepherd driving us out of our safe enclosures to find new nourishment, new life? Do we feel goodness and mercy on our heels, pursuing us even when we are not sure we’re ready to be found, not ready for the journey with God? Today I’d like to share with you a bit of what I see and hear on the journey with the people of St. Luke’s Episcopal Church in San Diego’s neighborhood of North Park, when God’s grace helps open my eyes. My husband Colin and I have been sent to St. Luke’s to serve as pastors and priests to the existing congregation, which is primarily Sudanese-American, and also to explore 21st century ways of being church and proclaiming the gospel. While we have not managed to find that perfect balance of rest and risk, either, here is where I see on the journey as the Spirit of Christ leads us, drives us, to new pastures of reconciliation and growth. I see a petite man and his even more petite wife, filing into church week after week with their five children in tow. In the past few months, our choir has begun to sing songs in Swahili with beautiful harmonies, led by two men who have been in this community for less than 6 months with their wives and children. They are from the Congo, and so they speak French and Swahili, not English and Arabic, like most of our congregants from the Sudan. And yet when someone in the congregation caught wind that they were looking for an Anglican church back in late October, they arranged for our van to pick them up each week, because they don’t have a car. And now the choir is singing more often in Swahili than Arabic, because the choir is open to change. I hear my church leaders, most who have been in the U.S. for 15 years or more, say that they want more than anything for St. Luke’s to be a place where refugees find a sense of home, whether they are from the Sudan or elsewhere, as the church did for them. I watch them make the calls and drive the vans and visit small apartments to pray with the family when they hear a relative has died, even though they are struggling with a language barrier, just like me. I see and hear the stream of men and women who gather in rooms below my office, singing together lines like Joni Mitchell’s “I’ve looked at life from both sides now.” They are the part of the recovery community, those who have found healing in 12-step programs; in the absence of other church programs, they have been the weekday blooms in the desert of our campus: about 16 groups meet in our facilities each week. I see a homeless men resting on stairs when I arrive at the office in the morning, and sometimes, depending on their number, it makes me a little nervous. And in the afternoons, I see two small girls resting on the same stairs. They come with their mom, also homeless, to pick up mail and toiletries and apply for jobs, and sometimes, when I see them, I am so glad they are in our courtyard and not waiting on a busy sidewalk: both scenes are because of an organization called Uptown Community Services, which now makes its home at St. Luke’s from 9am-3pm each weekday. Uptown is a faith-based non-profit for the homeless, offering mail services, basic toiletries, and computer workstations. I hear word from the Uptown board and staff about what good news our space brings to their guests, especially access to two bathrooms and a courtyard to rest outside for a bit in the shade. I see shared dreams taking shape on the horizon: a grant proposal with the International Rescue Committee to develop our vacant lot into a small urban farm for recently resettled refugees, with integrated job training in a certified kitchen and pop-up cafe right in the heart of our bustling neighborhood. I see 65 folks eating a potluck feast and listening to a reading from the Bible, but this is unlike any potluck I’ve ever been a part of before: I set the tables with my favorite handyman from AA, filled flower vases with a stay at home mom from the neighborhood and watched toddlers from her church test the vases’ stability, ate dinner with a lay leader from Sudan while listening to two friends who live on the street compare notes about the odd-jobs hunt. It was a Maundy Thursday community dinner that brought together folks from St. Luke’s, a nearby Nazarene church plant made up of young families, the recovery community, and Uptown clients. We sang a hymn that made all the Episcopalians squirm and then a woman I’d never met asked if she could wash my feet. There is more I could share, but let’s pause there. Colin and I are edging out of young adult status, but we still count as millennials, and we have a working theory about how evangelism, transformation, and conversion works most often with young adults. It does not belong to us, nor is it unique to us, but it finds a very welcome home with today’s gospel, and is central to our strategy at St. Luke’s: “Whoever enters by me will be saved, and will come in and go out and find pasture. I came that they may have life, and have abundance.” Coming in, going out, abundant life: the good news Jesus gives is very dynamic, not a static outsider to insider invitation into the sheepfold. For young adults on the lookout for truth and goodness, searching for truth with a capital T, beginning with an invitation to worship Jesus, to join the flock in the enclosure, may not be the best place to start. Inviting them to journey and work alongside Christ followers as we do the sort of reconciling kingdom work Jesus taught us to do seems like a better place to start: praying and sharing experiences of God in our lives as we try to walk in the way of Jesus, with the Spirit’s help, together. We will be recruiting folks in the neighborhood into small groups, each group organized a common project or mission that embodies in some way God’s healing and justice. As we work together, our meetings will still be oriented around prayer and a common meal. We will still talk about God, a lot. We will still rely on God’s grace. But we hope these might be communities where people see Christ at work, through transformation. This is an initiative of the Diocese of San Diego, so in very important ways, you are already a part of this; you have joined us. What we learn will be shared with the diocese, and we hope other churches might learn from our successes and failures. We are grateful for your support of these faithful experiments. I’d like to share one final story of journeying to unknown places. On our first Sunday at St. Luke’s, I looked out at the congregation as I gave my first homily and had a hiccup of faith. Was it Christ who had called us here? The real human differences between a young white Anglo and the pan-African elders looking up at me from the first few pews seemed, suddenly, too big. But I meekly said something about God knowing us better than we know ourselves, and a few of the ladies nodded firmly. I drew breath again, but still weakly. After the service, which had been something of an emotional rollercoaster, I felt on an even keel again as I ate the delicious potluck feast prepared to celebrate our arrival. But then something unexpected happened. My senior warden called me over to a side table, where the matriarchs sat, the five women who often sit together after services, because they don’t speak English. They want to speak to you, Joseph said. And then, one by one, through Joseph’s words of translation, I heard the most startling and Christlike words of welcome I’ve ever encountered: We were praying for a leader, Roda said, and God sent us two. I can see in you that you seek to walk in the ways of God and will lead us, Tabisa said. God has sent us a wise daughter, and we are so happy you are here. We welcome you as a daughter and as a pastor all at once. Do you see this feast of grace? I am a young white American woman with some slave holding ancestors who has never set foot on the great continent of Africa. Tabisa is a deacon and a war widow who raised six children through famine and violence. There is no earthly logic that would unite us in love and trust, that would invite her to affirm and bless me. Yet in God’s kingdom, through the glorious Christ who reigns and has called and shepherds both of us, we are indeed kindred. For a moment, in the basement at St. Luke’s, that knowledge moved from my head to my heart. I enjoyed a glimpse of a world transfigured, a source of faith, a pasture I’ve never quite seen in this way: it was the grace and surprise of God’s love overwhelming tired and feeble human patterns. And those minutes were glorious, beyond compare. They echo for me still. What voice do you hear? Where is Christ calling you -- as an individual, and as a church community -- to move, to journey, to risk, for life more abundant? We come in, and go out, and find pasture, nourishment we didn’t even know existed. Do not be afraid to leave your safe places, your safe patterns. Because God is alive, and closer than you know -- wherever you go. The Women’s March helped me connect to a collective malaise and anger that left me feeling affirmed and tentatively hopeful. But in the time that followed it seemed nothing concrete came from the mobilization, and I slowly slipped back into my Trump funk. The Faith Not Fear Summit run by the San Diego Organizing Project last Wednesday rocked my world. It gave me the same sense of belonging and shared power as the Women’s March, but it took place within a local political context: our representatives and police chief were there, nearby churches showed up, and SDOP is serving as the steady vehicle of our emerging local movement work. There are winnable campaigns ahead and the people to win them. I’ve got a place now to direct the energy that God has been building up in me. From the Christian perspective, this faith-based organizing work only makes sense in light of Jesus’ resurrection -- what we celebrated days ago on Easter Sunday. The deceits and insecurities and powers of this world that put Jesus to death paled in the face of a Love stronger than we can imagine. Surprisingly, it can be difficult to really see this Love -- and believe. On the first Easter morning, though the beloved disciple and Mary Magdalene saw and believed and told of their Lord’s rising, the rest of the disciples remained locked inside a room out of fear for their own lives. It’s so hard to trust news this good! The process repeats itself: now Jesus appears to the disciples so that they might believe, but Thomas, who was off on an errand at the time, wants to see for himself. Many of us need to see the risen Jesus to believe. I know I did. And even when we do, it can be hard to sustain that faith and hope. We need to keep seeing him to keep believing because so much of the rest of our sight is taken up by news that tempts us to despair. Sustaining hope, then, is a spiritual practice. It requires eyes to see God at work in this hurting world. I saw the Risen Christ on Wednesday night in the hundreds of women and men who packed Our Lady of Guadalupe Church to pledge their participation in the organizing work ahead; in the DACA Dreamer who had the courage to tell her story of growing up in a country whose president no longer wants her here; in the diversity of clergy ready to lead their congregations into this fight for the soul of our society. God has given us everything we need: love, shared power, and conviction that truth and justice will, when we work together, find a way to overcome in this time and every time ahead. Heart of Darkness, published in 1899, is British author Joseph Conrad’s famous novel about ivory trader Kurtz who sailed up the Congo river in Africa to manage a Belgian trading post in the heart of what was known then as the Congo Free State. The novel’s narrator is Marlow, the steamboat captain who tells his story to a group of fellow sailors aboard a boat anchored in the River Thames in England. As readers, we begin to realize early on that Conrad is leading us simultaneously outward and inward: journeying deep geographically into the heart of the African continent, as well as deep inside our own soul and conscience. Parallels and contrasts between Africa and Europe become painfully visible; it dawns on us that Conrad is using the horrific historical reality of Belgian King Leopold II‘s imperialistic exploitation of Africa’s natural resources and peoples as a backdrop for his fictional novel. The water of the Congo river provides fluidity for the story – a movement back in time to re-examine and ponder details of past lives (both fictional as well as historical), as well a movement through space to a place of darkness and horror. This past week we read about Jesus’ healing of the man born blind in John 9:1-41. John’s gospel story deals with blindness and the recovery of vision. Jesus’ strange action of spitting on the ground to make mud with his saliva, which is then applied to the blind man’s eyes, is totally puzzling and hard for us to understand. We learn that the blind man is then sent to the Pool of Siloam to wash the mud from his eyes and “came home seeing”. Even more confusing! Conrad and St John the evangelist perhaps both understood something quite fundamental about human nature. We are rarely capable of knowing for sure whether or not we ourselves are leading good lives. This is hardly an idle question given Jesus’ command to “Be perfect as your heavenly Father is perfect” in Matthew 5:48. It seems that in the course of our frantic lives, we rarely even ask ourselves that question. Is it really any consolation that most of us may not be as “morally repulsive” as Leopold II - who history records as having engaged in blatant genocide, forced labor, systematic mutilation, and selfish exploitation of natural resources and native cultures in what is today known as the Democratic Republic of Congo? Often, talking about “those repugnant evil other people” (always out there) turns out to be self-serving since this talk deflects attention away from ourselves. 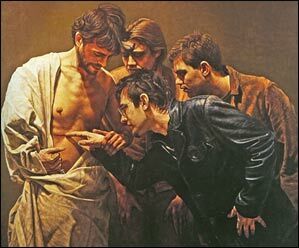 Returning now to Jesus’ application of dirt and spit to the blind man’s eyes in John’s gospel. Perhaps one way of understanding this strange story is that Jesus understood us better than we can imagine. He knew that each of us also needs to look within and take that terrifying journey into the Heart of our own Darkness – especially those of us who feel self-justified and self-righteous. We begin the interior journey by blinding/blindfolding ourselves first to the outside word just as Jesus did for the blind man. We simply stop, pause and detach ourselves from the world so that we begin to see ourselves within. And we move back in space and time between our past and current life. This difficult, seemingly unnatural activity has an end point and a destination: reawakening and cleansing waters. John’s gospel gives us a very real advantage however: unlike the blind man who simply was sent with instructions, we have already read how the story ends in that pool called Siloam. The New Testament account of Nicodemus’ nocturnal visit to Jesus in the Gospel of John initially seems to bear little resemblance to the visit this week of another Nicodemus – a Sudanese man who came to speak about his life with potential mentors of a new refugee outreach group – Sumitra - forming at St Lukes. The biblical Nicodemus was a Pharisee and member of the Jewish Sanhedrin in Jerusalem, ostensibly on a mission under cover of night. His official reason for the visit was to investigate and gather evidence against a troublemaker who was threatening law and order as well as destabilizing the entire religious establishment of the time. However, he was also apparently a careful man who understood that it is best not to rush to judgement or make decisions about anyone without first hearing them out. To this end, we learn that he later recommended that the entire Council first listen to Jesus before condemning him for heresy. In the 3rd chapter of John, Jesus uses language with Nicodemus which immediately throws him into confusion and chaos regarding literal vs. figurative meaning of words and ideas which strike at the heart of his birth, origin, identity, and place in the world. What? How can one be “born again from above”? Later in the 19th chapter of John, after Jesus’ crucifixion, we learn that Nicodemus wraps and prepares the body of Jesus with precious spices for burial. Apparently his earlier encounter led him to respect and honor Jesus to the point that he decided to become so intimately involved with his burial. The biblical Nicodemus was a religious legalist whose encounter with Jesus led him to ponder questions which went far beyond how to properly follow Jewish customs and law. This Nicodemus then disappears from any further mentions in any of the Gospels. His story disappears after Jesus’ death. Fast forward to an evening in North Park, San Diego last week, about 1950 years of so after the writing of the Gospel of St John which relates the mysterious story of Nicodemus the Pharisee meeting Jesus under the cover of darkness so long ago. A young Sudanese man named Nicodemus stood up before us and spoke for about 20 minutes. Turns out he was one of the 20,000 Lost Boys of Sudan: orphaned as a young child during the 2nd Sudanese Civil War (1983-2005), conscripted into a rebel militia, forced to walk thousands of miles, lived homeless without even knowing when he was born in a resettlement camp in Kenya, before arriving in San Diego back in 2001. This Nicodemus – the Nicodemus of Sudan and San Diego - told his personal story; a story that related acts of extraordinary kindness, generosity and hospitality on the part of several American individuals stretching back almost 16 years. He stood now proudly and confidently before us – a successful college graduate with an IT degree and now a Masters in Public Adminstration. He told us that the American educational system, along with the help and love of several volunteers, had taken the place of his parents. Back now to that 3rd Chapter of the Gospel of John in which Jesus spoke of being “born again”. The biblical Nicodemus really struggled to understand what Jesus was talking about that night. Jesus’ words mysteriously scintillated and fluctuated between literal and symbolic meanings in an attempt to open a space between earth and heaven for Nicodemus. The Sudanese Nicodemus, I suspect, understood Jesus’ words without confusion or hesitation …. in a way that perhaps few in our audience of potential mentors/volunteers for Sumitra that night could grasp, what it means to be born again. An interview on KOGO news radio on Mon, Jan 30 on the impact the executive order on local refugees.